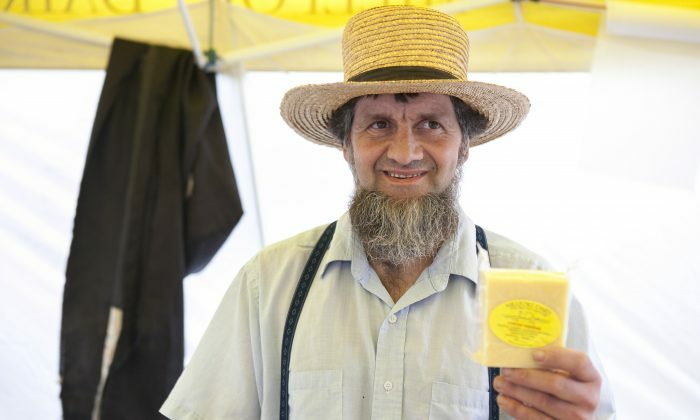 NEW YORK—Beneath a soot-tinted yellow tent, John Stoltzfoos, a 48-year-old Amish farmer, sells his raw milk cheese and pickles at the Union Square Greenmarket. A few feet away, a man in a speedo is dancing in a crazed trance. Stoltzfoos appears unaffected by the spectacle and continues his work. “Pickles: spicy, sweet, beets, peppers, radishes,” he calls out in a slow, rural drawl. The Amish community adheres to a religious lifestyle where they live without electricity and travel by horse-drawn buggies. Stoltzfoos travels by truck four times a week to sell products such as sweet cream salted tub butter and free range eggs from Millport Dairy, a farm in Leola, Pa., owned by his uncle. A hunched woman with a walker and a knotted silver bun slinks up to Stoltzfoos’s stand and begins to take cheese samples. She takes one of each. She goes for seconds. Stoltzfoos wears a grayish-black Columbia windbreaker, loose black pants, and a straw hat with a petite bow. His bangs are cut crooked. He has remarkably straight teeth. “Oh, he’s really fussy, he just talks and talks,” Stoltzfoos said, as he tries to suppress a smile. Fryer, who is not Amish himself, has been driving Stoltzfoos from Lancaster County, Pa., to New York City for the past six years. Each round trip takes seven hours, and they make the trek four times a week. On those days, Stoltzfoos wakes up at 2 in the morning; Fryer wakes up at 1. “We’re running on a lot of empties,” Fryer said. They drink a good deal of coffee and energy drinks. The pair can return to Lancaster by 9 o’clock if that “silly New York traffic on the way back” is good to them. At home, Stoltzfoos exchanges a few words with his family then hits the sack. He gets up at 2 a.m. to do it all again the next morning. For the past quarter of a century, Amish farmers have been traveling to increasingly further locations to find markets for their products. “Many Amish people have been forced out of traditional farming because of high land prices and the difficulty of competing with corporate farming,” Donald Kraybill, co-author of “The Amish,” wrote in an email. Amish farmers like Stoltzfoos journey to farmers markets in cities such as Baltimore, D.C., Cleveland, Chicago, New Jersey, and the Reading Terminal Market in Philadelphia to sell their products for higher prices. On Thursdays, Stoltzfoos is at the farmer’s market at Columbia University; on Saturdays, he’s in Tribeca; on Wednesdays and Fridays he’s at Union Square. So far, he hasn’t seen any other Amish farmers in the city’s farmers markets. But there are around three dozen Amish farmers markets in the eastern metropolis, from New York to D.C., according to Kraybill. So how much of Amish ways does one give up during those travels? It’s a choice. To get to New York, Stoltzfoos abandons the horse and buggy for a truck. He allows the media to take photographs of him, but not too many. According to William Fischel, a Dartmouth economics professor who studies the Amish education system in modern society, many Amish outside of Pennsylvania have had to adapt to working in factories and on construction sites. But that doesn’t mean they have to give up their faith. “The Amish continue to grow in numbers and spread to new territories, and their resilience is both a credit to them and to the pliability of the American economic and social mores,” Fischel wrote in an email. Since 1992, the Amish population in New York state has increased from 4,050 to 15,930, according to research from Elizabethtown College. “This will require some adjustment by the Amish, but it does not seem to be fatal to their religious identification and strong sense of community,” Fischel wrote. He spends Mondays and Tuesdays making and packaging raw cheese. His only day off is Sunday. In his spare time, Stoltzfoos likes to fix engines. He is currently working on a WD-9 tractor from the 1940s, and he is also restoring a two-wheeled horse cart made of wood and steel. Stoltzfoos’s hefty beard signifies that he is married. He has four daughters, one grandchild, and a 13-year-old son. He has a photo of his family in his wooden box, which also serves as a cash register. He keeps a record of transactions by hand on a small note pad. Stoltzfoos was born on a 168-acre-dairy-farm in Strasburg, Pa., a village known for its antique railroads and Amish farmland. Adhering to Amish tradition, Stoltzfoos finished school at the eighth grade. He milked 45 cows a day. After he finished school, he milked 63 while taking weekly vocational classes where he studied German and spiritual principles. They live simply. They trust, and it’s a trait that New Yorkers are sensing from Stoltzfoos. Some of Stoltzfoos’s regular customers leave their bags behind his table as they shop. He doesn’t mind the long hours. He thinks of these trips to New York City more as a hobby rather than work. “It’s a place where we’re meeting many different kinds of people, people with all different kinds of beliefs, and it’s amazing how we can all get along, anyway,” he said. Wang Lu Ri is a Buddhist artist who gave up an 8-year graduate degree in art to suffer and draw caricatures in Times Square.